Define the media term, 'genre' analyse 3 television programs for their codes and conventions. Define the media term, 'genre' analyse 3 television programs for their codes and conventions. "If a group of media texts have a similar form/structure or pattern of elements, then this might be due to a link in genre. Films of the same genre have distinctive characteristics or conventions, but individual elements that make them distinct." 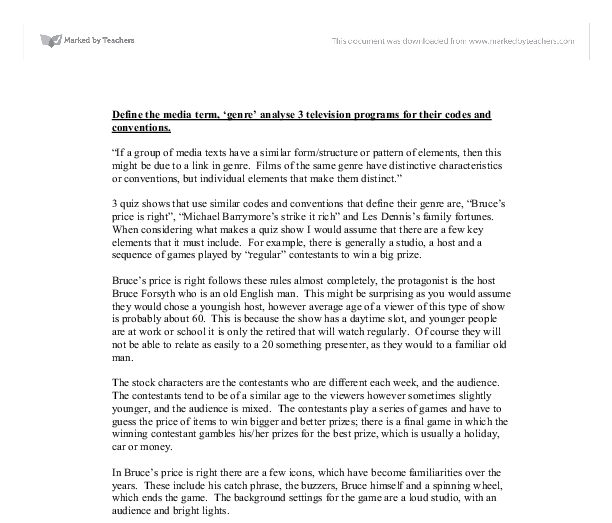 3 quiz shows that use similar codes and conventions that define their genre are, "Bruce's price is right", "Michael Barrymore's strike it rich" and Les Dennis's family fortunes. When considering what makes a quiz show I would assume that there are a few key elements that it must include. For example, there is generally a studio, a host and a sequence of games played by "regular" contestants to win a big prize. ...read more. In Bruce's price is right there are a few icons, which have become familiarities over the years. These include his catch phrase, the buzzers, Bruce himself and a spinning wheel, which ends the game. The background settings for the game are a loud studio, with an audience and bright lights. Michael Barrymore's strike it rich is similar in many ways, because of its time slot the protagonist is an older man. I think the reason they chose a male presenter is because of the older audience again, they are probably more comfortable with a man than a woman. Similarly the stock characters are the audience and the contestants, the host introduces them and aloud to talk about themselves while the host makes comments which are supposed to make people laugh. ...read more. The stock characters were the audience and two families who acted as the contestants. To win things they were asked a question like "what would you take to the beach?" and had to pick the answer they thought 100 people were most likely to say. Then at the end when one family wins, they send one person to play in the final quiz. The icons for this program were similarly the host and buzzers, however the families have become icons and so has the phrase "our survey says". |The background for this program is less vibrant, with a board in the middle and more subdued background to reflect the fact it is a more serious show. 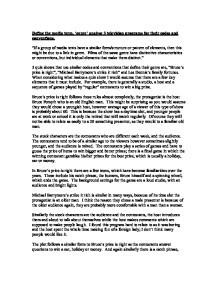 The forms and conventions of quiz shows are generally similar, this is because the viewers are expecting it, and they don't need to do much to get people to watch. ...read more. studios were ordered to give up their theaters in what is commonly referred to as "divestiture:" opening the market to smaller producers. This, coupled with the advent of television in the 1950s, seriously compromised the studio system's power and profits. Inside this area the 'babby' scene and 'death scene' take place. There are also some solo scenes of Donald which are acted here. 2) The character called Angela has a doll because it is the theme of the 'babby' scene. The opening scene shows the boys entering the house. They are all very excited, but there is calm music in the background, which contrasts the boys' mood. The music could be interpreted as the calm before the storm, as the audience gets the impression something is going to happen. We condensed this information and decided to present it at the start of the documentary. What our documentary lacked was statistical information which proved very hard to find. We also want to show archive footage of 'rude boys' during this which was also very difficult to find. The prizes need to be good and make people want to play on the game, and the better the prizes, the more people push to get better scores. This makes the game more exciting and challenging. The prizes I have decided to have in my game is money and a holiday. but this doesn't stop the worlds best deep core drilling team. There are a few more small problems throughout the rest of the film, such as NASA trying to remote detonate the nuke before the hole was finished, the severe conditions killing some of the crew and problems with the ship. to build up tension whereas in The Wheel of Fortune they help to create a much more relaxed and informal atmosphere.